Juvéderm Voluma XC is a gel that is injected into the cheek area to gently lift the skin and restore volume that is lost from aging. It is made from a modified form of hyaluronic acid which is a natural complex sugar that occurs within our bodies. What is Juvéderm Voluma XC indicated for? Juvéderm Voluma is the first and only FDA-approved non-surgical option to instantly correct age-related volume loss in the cheek area in patients 21 and older. Juvéderm Voluma has been used in Europe since 2005 and approved in over 60 countries with over 500,000 syringes used. How is Juvéderm Voluma XC actually used in treatment? In Europe and Canada Juvéderm Voluma has been widely and very successfully used for off label FDA uses for lifting, volumizing and recontouring the face and jawline. Injection using little blunt microcannulas in addition to traditional small needles is also widely used for helping create a natural look while minimizing discomfort and bruising. 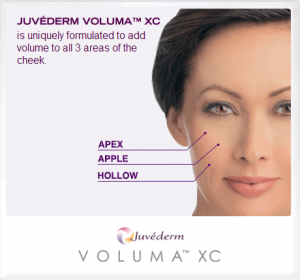 What makes Juvéderm Voluma XC different from other dermal fillers? How long does Juvéderm Voluma last? Up to two years with optimal correction. There is evidence that hyaluronic acid fillers such as Juvéderm and Restylane actually help to stimulate the production of new collagen by your own body so that longer duration of improvement may be seen. Also depending on various factors of your health, weight and body chemistry as well as the volume injected and the skill of the injector duration of correction may be shorter (or even longer) than two years. Why use Juvéderm Voluma XC and not a wrinkle filler? While wrinkle fillers traditionally have been the mainstay of filler treatments and offer excellent results when properly used, Voluma opens up a whole new world of opportunities for rejuvenation. In particular, its ability to lift skin distant from where it is injected in the cheeks often reduces or may even eliminate the need for filling other lines and wrinkles – or at least decrease the amount of filler material needed. This can be very important because the cost to add Voluma to your treatment plan may be significantly offset by the savings of not needing some of the filler you may have needed in the past in the folds around the mouth. What does the XC after Juvéderm Voluma XC mean? XC means there is a small amount of lidocaine mixed with the Juvéderm which helps to numb the area during the treatment process. There is typically minimal discomfort during the treatment process. Topical numbing cream may be applied before treatment to reduce discomfort – especially for sensitive areas such as fine lines around the mouth. Numbing shots are normally not needed so that you do not have the long-lasting dental type numbing effects after you leave the office. If you are being treated with the micro cannulas typically there is even less discomfort than with needles. No. Allergy testing was once required in years past for other non-HA fillers, but not Juvéderm or other brands of hyaluronic acid fillers which are very safe. How young can you be treated? While we do not want to treat with fillers before they are really needed, the experience in Europe, Canada and elsewhere suggests that a relatively small amount of Juvéderm Voluma can produce a very pretty soft, natural look in younger patients who are showing early signs of aging or who have a tired look. Its actual FDA approval is for use over age 21. Does it matter if I am 30, 40, 50 or older for treating or for the results I will see? Yes it does. While you may benefit at any of these ages – as well as much older, there are potential differences. Younger women (and men) who do not have much skin laxity and who have primarily some early fat volume loss in their cheeks may see a relatively dramatic restoration of their youthful appearance before the fat loss occurred. Also the amount of volume of Juvéderm Voluma XC needed to produce these results may be relatively small – thus giving a really nice benefit for a relatively low cost. As time passes and more aging changes have occurred (especially for smokers or people who have severe sun damage or who may have had significant weight loss and other lifestyle and medical factors) the amount of Juvéderm Voluma XC required to produce optimal correction or restoration does increase and the costs also increase accordingly. The results still will usually be impressive but may need to be combined with some other non-surgical procedures to create the most pleasing overall anti-aging effects. However for people who have been receiving other fillers in the past, they may find improved results for less total volume of filler material and also with greater longevity. Practically speaking there really are not so much absolute age limits for you to have very nice results with Juvéderm Voluma XC. Some people are biologically much younger (or older) looking than their chronologic age and one of the really critical factors is for you to consult with an expert injector who has a good eye for the artistic natural look and also has the technical skills and who is an experienced injector that understands Juvéderm Voluma well. You really also would like to choose someone for your consultation who will listen to what your goals are and also your lifestyle factors and budget and try to give you an individualized and practical treatment plan designed just for you. Yes. Juvéderm Voluma is excellent for all skin types. People with darker skin of color usually do not wrinkle as much as lighter skin tones, but everyone experiences age-related volume loss in their cheeks. Darker ethnic skin patients tend to be more likely to develop dull, ashy or unevenly pigmented skin which can be improved with skin brighteners (SkinMedica Lytera Cream is a product from the creators of Juvéderm Voluma which often works well for these darker skin patients also still experience sagging of the apex of the cheek with aging and this may appear at a relatively young age. The cheek apex is what gives a youthful look to the face so restoring this can provide a very pleasing, natural and youthful look and typically this does not require much of the Juvéderm Voluma due to its unique filling and lifting ability problems). Yes, however the technique is somewhat different especially for cheeks because what is optimal to create a younger male appearance differs from that needed for females. That depends on the extent of the areas being treated, the volume of Juvéderm Voluma being used and also the complexity of the treatment. Simple injections might take only 15 or 20 minutes, but treatment can require considerably more time depending on what is being treated. For example full face sculpting may require using more of an artist’s pallet approach with the use of both needles and the European micro cannula technique and we sometimes need to blend the Voluma with additional lidocaine to customize treatment for non-cheek areas. We may also use other forms of Juvéderm such as Juvéderm Ultra or Ultra Plus to treat residual smile lines or furrows (note that by lifting the cheek, Voluma often reduces or eliminates the need to treat nasolabial or nose-to-lip folds and smile lines). So the more complete and creative the treatment the more treatment time is required. The artistry is a vital part of truly rejuvenating the whole face and that adds another dimension beyond just the technical skills for injecting. Juvéderm Voluma is a dramatic addition to our artist’s pallet and as cosmetic artists we want to create the most natural beautiful appearance we can. Does Juvéderm Voluma require any special techniques or training? Yes. Because of the unique properties and long-lasting nature of Juvéderm Voluma some special training is required. Allergan, the company who makes Juvéderm, requires some special training, but to achieve the full artistic potential that Voluma can provide requires experience Voluma as well as with facial sculpting and volumizing. This is not your mother’s wrinkle filler! The injection techniques that provide a very natural look have been refined in Europe, Canada, Brazil and many other countries over the last several years and using what we have learned from the leaders overseas really helps produce the best results. Many Juvéderm Voluma experts use a mixture of both fine needles and micro cannulas. Typically expert injectors may also combine with other forms of Juvéderm and sometimes blend in more local anesthetic or may combine with other products such as Botox to achieve the desired beautification. What are micro cannulas and how do they work? Micro cannulas are small, long, slightly flexible ‘needle-like’ devices which are blunt on the end and have a hole in the side where the filler exits. With the micro cannulas a small sharp needle is inserted into the skin and then removed and the cannula is then inserted. The needle creates a guide or entrance pinhole for the cannula – which is blunt and cannot by itself penetrate the skin – and then relatively large areas of the cheek can be injected and sculpted via this one tiny needle area. It is less painful than a series of needle injections and also helps reduce bruising. Note that micro cannula techniques require an experienced and skilled injector for optimal results. Can you combine Juvéderm Voluma XC with other facial anti-aging treatments? Yes that is a great question. Often for optimal restoration of a youthful appearance more than one modality is needed. So Juvéderm Voluma restores volume and can lift sagging skin. If the outside of the skin has chronic sun damage and is thinning from lost collagen then a fractional laser or IPL treatment may be useful. Likewise, if spider veins dominate the landscape of your face, a blood vessel laser treatment may be helpful. Lines of facial expression often will respond well to Botox and a particularly good combination is Botox and Juvéderm Voluma. Eyes are important as well and sometimes a bit of a ‘lift’ can be achieve by either Botox or Juvéderm. Eyelashes can be made longer, thicker and darker using Latisse. Topical skin products such as Retin A and antioxidants help to repair old damage as well as to protect your investment in some of these treatments. Allergan, the creator of Juvéderm and Botox, also makes Skin Medica which is one of the leading science-based lines of anti-aging skin care products and their new Lytera creamhelps improve uneven skin pigment. Many combinations are possible and should be customized to your skin, your lifestyle and budget. Does it matter when you combine these treatments? Yes. It is thought that some combination of treatments – especially when treating the same anatomic area – may in most cases be better performed at different times. This is especially true for some of the laser and light treatments or peels which can create swelling and possibly interface with the use of Botox at the same time. You should discuss with your physician because many treatments can be combined at the same treatment visit. Botox and Juvéderm for example are often a great combination at the same time, but there also are exceptions to this as well. Juvéderm Voluma XC results are immediate and very natural looking, so typically you may return to work or social activities immediately. However, sometimes transient side effects occur – in particular bruising – and mild swelling may develop by the next day, so you do need to consider this in your planning. This is especially true if you have never been treated before or if you are taking things which might increase your risk or the severity of bruising like baby aspirin, blood thinners, fish oil, etc. So discuss this with your physician. What are the common side effects of Juvéderm Voluma XC? Typically you might experience temporary bruising, tenderness, swelling, pain during injection or some redness or itching. Lumps and bumps are possible but usually are easily massaged out either at the time of treatment or a few days later. Depending on your facial anatomy sometimes asymmetry or unevenness from side-to-side might be experienced which can usually be easily corrected, however people commonly have some degree of natural asymmetry which may not be able to be perfectly matched. Most of these are very transient but may in some cases last for a few weeks. Consult with your doctor about your particular situation. What can be done to prevent bruising? Bruising is one of the most common side effects. Tiny bruises at the sites of needle entry may be very inconspicuous and easily covered, but larger or darker bruising that is visible and lasts for days or rarely longer can be rather unsightly. Sometimes (if medically safe) people taking daily aspirin or other blood thinners may temporarily discontinue treatment (always consult your prescribing physician first if you are taking these for medical conditions). Fish oil supplements may be discontinued for a week before treatment and then resumed. If your injector has a pulsed dye laser or certain types of IPL you may be able to return within 24-48 hours for a quick zap. These typically are very safe and speed the resolution of the bruising. What if I don’t like the results – can Juvéderm Voluma XC be removed? Yes all hyaluronic acid fillers can be ‘removed’ using a synthetic form of an enzyme that occurs naturally in our bodies called hyaluronidase. Usually the filler can be removed in hours to a few days after injecting the appropriate amount of hyaluronidase. All Juvéderm products including Voluma may be treated this way. It is another important distinction between Juvéderm Voluma and some of the other longer-lasting fillers which are not hyaluronic acid because they often cannot be removed if you are unhappy. How often can I be injected? A better question is when do you need to be re-injected? Since Juvéderm Voluma is very long-lasting filler you typically would not need to be treated again for a long time…up to two years or more. However re-injection may be needed a few weeks after your initial injection if you need more volume or more lift. Often it is better to be conservative and touch-up if needed. I personally see so many people who have been over-injected or overfilled and this is especially true I find for cheeks and lips. While certain people in the entertainment business for example may with intentionally desire a bit more exaggerated look, I have a very strong commitment to creating a very natural, soft, rested appearance. It is nearly always better in my opinion to remain natural and understated – especially if you have never been treated before. Juvéderm Voluma does not require as much volume as other hyaluronic acid fillers to create the effect you want and so care must be taken for injectors who are not as experienced with Voluma to not overdo your treatment. Allergan, the creator of Juvéderm Voluma XC has made exceptional efforts to provide proper training for Voluma and it really is very important that you have an experienced injector. I also suggest you ask to view photos of the actual injector who will be treating you so you can see their results and judge for yourself if that look ‘fits’ you. Some of the best Juvéderm Voluma injectors in the world will tell you that optimal correction will give you the ‘best’ overall look and the longest duration. To achieve this you may need to return for some touch-up or additional amount of Voluma to achieve this result…and that doing this typically then leads to the longest correction before you need injected again. So your goal should be to ‘get it right’ and then to not need to be injected again until the results begin to fade. That is a great question but it has a very individualized answer. Because Juvéderm Voluma is such a ground-breaking filler it really is quite a bit different than you might be used to from your experience with previous fillers. With Voluma we are now not only restoring volume but also providing lift and some indirect tightening. So if you have been injected with fillers in the past you need to think more about ‘full face rejuvenation’ – and think less about ‘filling lines and wrinkles’. Much of the filling of lines/wrinkles/ folds of the past will either not be needed – or the amount of filler needed will be significantly reduced. There is still an important role for Juvéderm Ultra XC for example or Restylane if you have been using those but the volume of these fillers needed (and thus the number of syringes) likely will be reduced if not eliminated. So again if you have had filler injected in the past, the total cost is not just the cost of the Voluma you need, but you need to factor in however much less you might need of the fillers you have used in the past. You really need to think ‘total facial rejuvenation’ …this is very important. With Juvéderm Voluma and other treatments like Botox, laser, etc. we now have the ability to create results non-surgically that truly will change the way facial aesthetic/cosmetic treatments are performed and the results you can expect. I believe this is the wave of the future and you should think more about discussing with your cosmetic surgeon a ‘treatment plan’ for overall facial beautification and full rejuvenation and what the cost of that is. Look at the cost over time as well. For example if Juvéderm Voluma last twice as long but costs less than twice as much (not to mention that it probably produces better and more natural results and you have to come in less often) than what you have been doing then the cost over time may be less with Voluma. So the old saying ‘less is more’ really does apply to Juvéderm Voluma because the same size syringe of Voluma can produce a significantly different (and typically greater) effect than the same size syringe of other hyaluronic acid fillers. So you should ask your cosmetic surgeon to show you what can be done for the big overall picture – not just to fill a few lines and wrinkles and then compare fees….and compare the overall improvement in your appearance and how long that improvement lasts…that is a better way to look at fees.